This remarkable, innovative book explores the significance in Shakespeare's plays of oaths, vows, contracts, pledges, and the other utterances and acts by which characters commit themselves to the truth of things past, present, and to come. In early modern England, such binding language was everywhere. Oaths of office, marriage vows, legal bonds, and casual, everyday profanity gave shape and texture to life. The proper use of such language, and the extent of its power to bind, was argued over by lawyers, religious writers, and satirists, and these debates inform literature and drama. 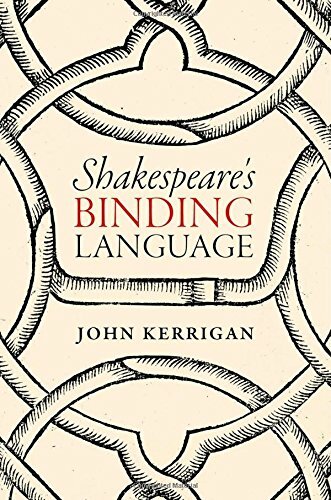 Shakespeare's Binding Language gives a freshly researched account of these contexts, but it is focused on Shakespeare's plays. What motives should we look for when characters asseverate or promise? How far is binding language self-persuasive or deceptive? When is it allowable to break a vow? How do oaths and promises structure an audience's expectations? Across the sweep of Shakespeare's career, from the early histories to the late romances, this book opens new perspectives on key dramatic moments and illuminates language and action. Each chapter gives an account of a play or group of plays, yet the study builds to a sustained investigation of some of the most important systems, institutions, and controversies in early modern England, and of the wiring of Shakespearean dramaturgy. Scholarly but accessible, and offering startling insights, this is a major contribution to Shakespeare studies by one of the leading figures in the field.